Make an afternoon of it! The Grave Garden Fête is a perfect event for you and your plant-loving pal, crafty friend, mom or grandma, wacky aunt, dog, or tapophile friend! Pack a picnic, bring a blanket, and come enjoy the grave gardens that are brightening the cemetery, planted by our famous volunteer group, the Grave Gardeners! We have teamed up with PHS : Pennsylvania Horticultural Society to organize a day of botanically-themed workshops, demonstrations, and fun make-and-takes! Workshops are ongoing throughout the day and ALL WORKSHOPS AND MATERIALS ARE INCLUDED in the cost of admission. 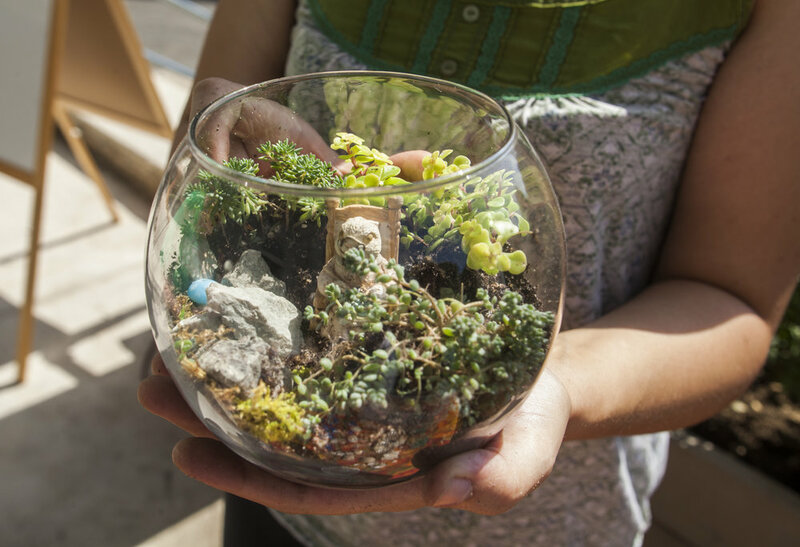 Build Your Own Terrarium with PHS’s Sally McCabe 1:00 - 5:00 PM: Participants will be provided with all the materials they need to create a custom terrarium to bring home. Go classic Victorian with Ferns, prehistoric with succulents and mini dinos, or take some macabre inspiration from the surroundings and adorn your terrarium with mini headstones! Natural Dye Processes and Techniques with Sydney Hernandez, creative dye specialist at Free People 1:00 - 5:00 PM: Learn how to prepare natural dye from plants harvested at The Woodlands and then dye your own cotton bandanna! Sydney will demonstrate the process of making natural plant dyes and cover a variety of different techniques. Participants can experiment and dye their own cotton bandanna to take home. Plants in Early Medicine with the Mütter Museum 1:00 - 5:00 PM: Learn about early medicinal uses of plants with representatives from the Mütter Museum at the grave of Dr. David Jayne, a druggist who made proprietary plant-based medicines in Philadelphia in the early 19th century! Bulb Planting with the Woodlands Grave Gardeners 1:30 - 3:30 PM: Seasoned grave gardeners will demonstrate how to plant bulbs for spring while executing a vibrant planting scheme at the family lot of Henry Dreer, a 19th century Philadelphia seedsman. Join in to learn and help, then come back in the spring to see the display! Secrets of Plant Propagation with Josh Darfler Part I, 1:30 - 2:00 PM: The key to a great spring garden is to start planning today! Joshua Darfler, Greenhouse and Garden Manager for the Department of Biology at the University of Pennsylvania, will lead a workshop on how to collect, clean, and store seeds from this year’s flowers to get ready for the next growing season. Josh will demonstrate various techniques to get seeds to germinate at the correct time, and will even tell you about what seeds you an sow this fall to get a jump start on next year’s display. Secrets of Plant Propagation with Josh Darfler Part II, 2:30 - 3:00 PM: Do you have a rose bush that you just adore and can’t find at any store, or are you jealous of your neighbors cherry tree and you want to get one for free? Josh will give a demonstration on how to propagate a variety of plants through cuttings and show you some tricks and tools of the trade to perform root cuttings at home. Secrets of Plant Propagation with Josh Darfler Part III, 3:30 - 3:00 PM: Succulents make great house and desk plants. They are low maintenance, adaptable, and most importantly easy to propagate! Josh will give a how-to on propagate your own succulents and cacti so you can trade with your friends and grow your collection. Medicinal Plant Walks with Kelly McCarthy from Attic Apothecary 1:30 - 2:00 PM and 2:30 - 3:00 PM: Tour the cemetery and learn about medicinal plants that grow in grave gardens and around the site! (The same tour is offered at two time slots). Grave Garden Tours: Take a tour of the grave gardens with a grave gardener and learn about the history of horticulture in cemeteries! Tours will be offered every hour, on the hour. Food and drink will be available for purchase to supplement home-made picnics. Please note: There will be limited parking allowed on the grounds for this event. Street parking is also available in the surrounding neighborhood. Walking, biking, and use of public transportation are highly recommended.